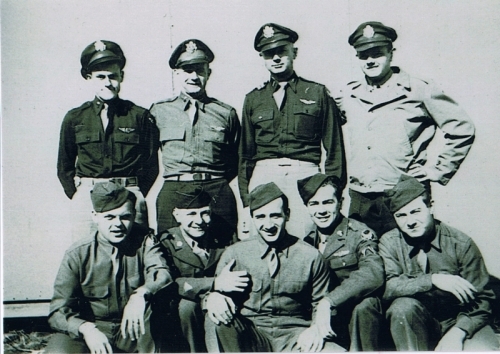 Standing L to R: Harold Estill (BOM), Raymond Blohm (P), Bill Larson (CP), Willis Magathan (NAV). Kneeling L to R: Albert Paulik (BTG), John Parascouly, Jr. (ROG), Rinaldo Principe (TTE), John Redmon, Jr. (TG), Walton Jennings (WG). The copilot pictured is not Sammy Gunn. It is Bill Larson. I think the photo was taken either in Ardmore, Oklahoma or Lincoln, Nebraska, prior to having Lt. Sammy Gunn assigned to replace Bill Larson.